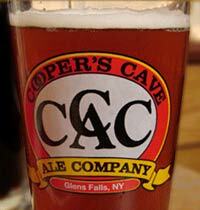 Just after its two-year anniversary, Cooper's Cave Ale Co. has announced exciting news! The pub is growing, yet again, and will soon be offering an outdoor dining experience. Construction is underway on an 800-square-foot deck that will allow patrons to enjoy a meal and or a beer outside, overlooking the Warren county bike trail. The deck will be covered, allowing outdoor seating to be available three seasons out of the year, during any type of weather. Construction of the deck will be dependent on the weather and other factors, but the owners expect it to open at some point this summer. As warmer weather rolls in, this will be a great addition to the outdoor dining scene in the Glens Falls NY area.